4 Seats in Dark Blue. This 1930 style 4 door beauford tourer has a dark blue bonnet and fenders over peacock blue paintwork. The interior is finished in light blue leather upholstery with matching dark blue carpets. It has a full length cantilever style black hood for complete weather protection. 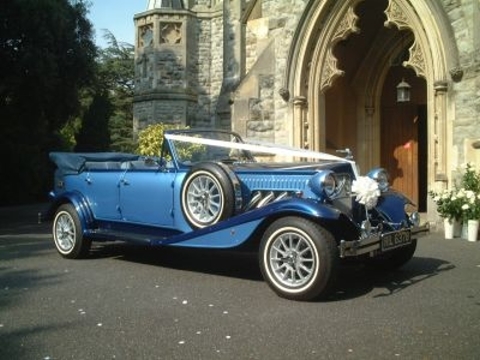 This can be raised or lowered easily to give the bridle couple the ultimate in open air wedding transport. This vehicle colour matches the Daimler limousine and makes an ideal two car package.